For eons we humans have called on our ancestors in times of trouble, and that need still exists today. Making peace with the past is essential for making peace in the present and the future. The expression of grief is often considered one of the highest forms of prayer, because the act of grieving acknowledges our deep love and gratitude for the blessing of life itself. It is commonly believed that violence and anger are the result of unexpressed sorrow and grief. Celebrating life in a ceremonial way creates a safe place for the whole community to grieve together. Each one of us has been touched and shaped by others who are no longer here. October is a time for ghouls, ghosts, trick-or-treaters and candy, but there is something much spiritually deeper and ancient than what we see on the surface of these modern festivities. It is our responsibility to keep the memory and wisdom of our ancestors alive in our own lives, to forgive the past while embracing the present moment. In a society that focuses on accomplishments and being busy all of the time, the courage to embrace each other in the vulnerable realm of our emotions and feelings is priceless. We will pass from this life some day, and taking time to remember that can inspire us to live with love and compassion for all who share this life with us. 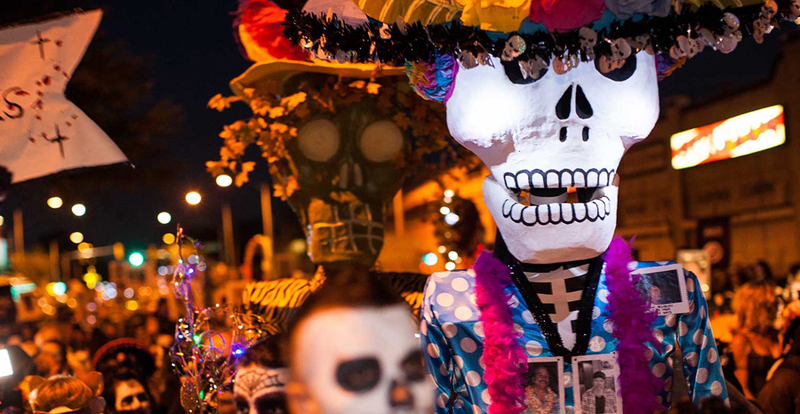 Imagine more than 50,000 people of all ages including children, parents and grandparents pulling floats honoring their ancestors wearing La Catrina whiteface alongside drummers, stilt walkers, and samba dancers parading through the city streets. It happens every year in Tucson, Arizona. This year marks The 28th Annual All Souls Procession and there is nothing quite like it anywhere in the world. A giant urn is wheeled through the crowd collecting the prayers, wishes, and dreams of each participant as it passes. At the end of the procession the urn is hoisted high above the crowd in preparation of a grand finale filled with fire and spectacle. It is ceremony in an ancient but contemporary form, a creative expression of community that is so important yet often missing in our modern world. The giant burning urn may conjure thoughts of the popular Burning Man Festival, but there is a profound difference. 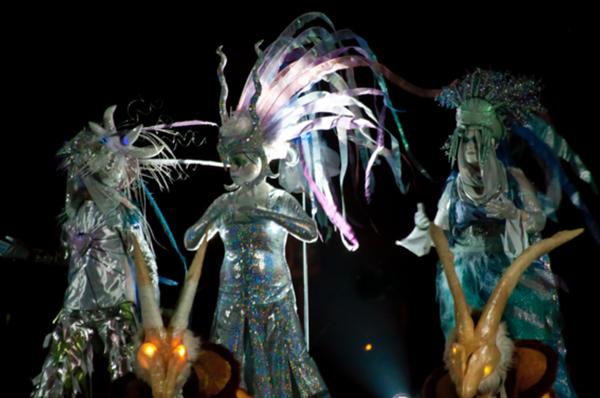 The All Souls Procession is a free, cross-generational, sober event that is integrated into an urban center with cultural roots that go back for millennia. Incorporating elements of contemporary Day of The Dead like sugar skulls, marigolds, and elaborate shrines lit by candles, the weekend is filled with meaningful events, performances, and an invitation for all to participate. Tucson is an ancient place surrounded by the majesty of the Sonoran Desert and many diverse communities. Arizona is filled with vibrant Native American culture from The Apache to Hopi, Navajo, Yaqui, Tohono O’odham and many others. Tucson sits at the cross-roads between north and south with a rich history of Spanish Missions, outlaws, and cowboys. These natural and historical elements are blended together under the direction of Nadia Hagen, Paul Weir, through the non-profit organization, Many Mouths One Stomach and powered by an army of local volunteers who are all dedicated to making sure that each year is better than the previous. All Souls workshops span the whole month of October and culminate on November 4, and 5. Saturday at Armory Park is The Procession of Little Angels, where kids paint their own angel wings and sugar skulls while watching performances from Stories That Soar and Tucson Circus Arts followed by a sunset Lantern Procession around the park. 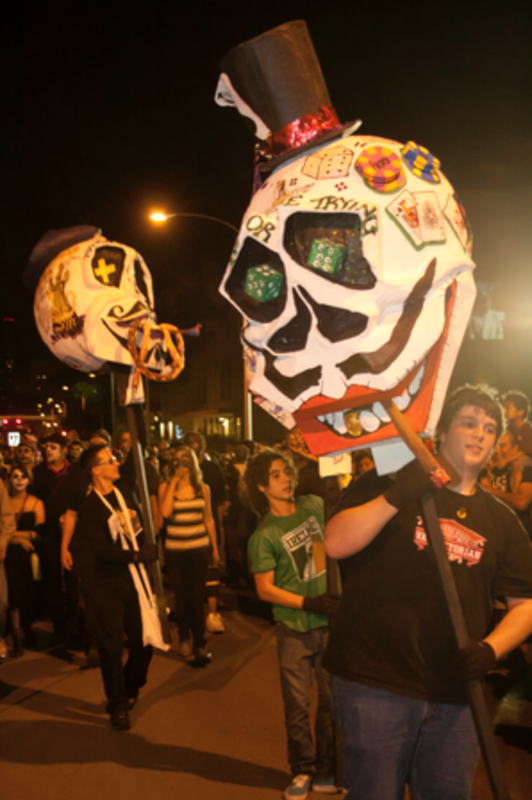 Sunday is the All Souls Procession and Finale with floats, bands and big crews assembling at 4 p.m. for the procession. This year also brings the premiere of Many Bones One Heart, a documentary film about the procession by Leslie Ann Epperson. The Grand Finale is hosted by Flam Chen, one of the nation’s oldest fire circus theatrical groups. 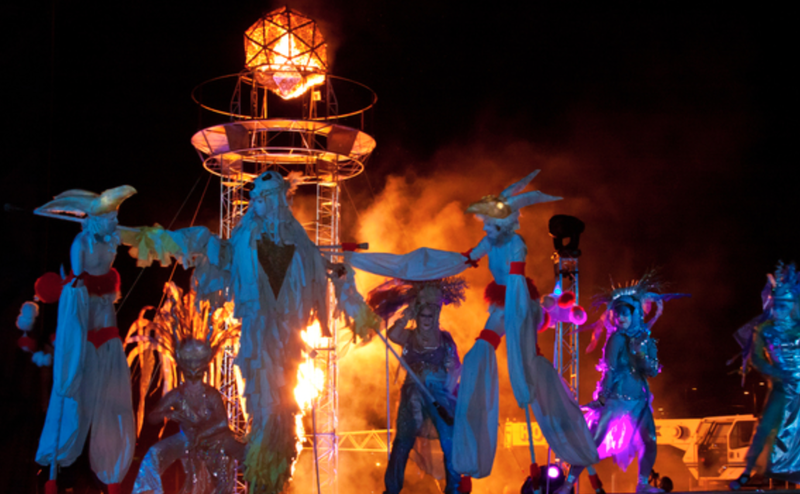 Watch silk aerialists dangle from a crane above the urn which is lifted onto a scaffold while fire spinners, folklorico dancers, hauntingly beautiful music, and acrobatic stilt walkers fill the stage under the desert sky with city skyscrapers just a few blocks away. The urn, made of geometrical patterns, now filled with mementos collected during the procession is set ablaze. It lights up like a lantern warming the faces of onlookers setting their dreams and prayers free with a roar of cheers (and tears) from the crowd. Local artist and photographer Stu Jenks has compiled some of the best photos of previous All Souls Processions into an Ibook called, It’s a Mystery, and all proceeds from the purchase of this visual odyssey go directly to supporting this free community event. Two other Ibooks were also created recently to help families bring depth and meaning to this season. The first book, Procession of Little Angels, is a scrap-book with photos and illustrations for children, the second is The All Souls Loteria, both by Nadia Hagen. Visit their donation page here and look for their Facebook page to see photos posted shortly after the event. Wherever you may be in the days following Halloween this year, please take a moment to remember all those who have come before you and reflect on what it means to be alive.